Some of the places I've walked for exercise and leisure this month. Via St Denys Road, Cobden Bridge, Bullar Road, Bitterne Road, Northam Bridge, Princes Street, Chapel, Itchen Bridge, Woolston, Weston Shore, Netley, Royal Victoria Country Park, Hamble Lane, Hamble Square. 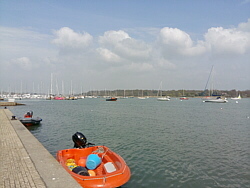 Down to Hamble Quay. 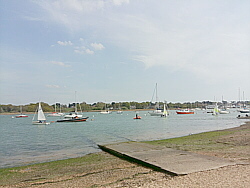 A refreshment break by the river, then via Green Lane and Hamble Common to Hamble Point, along the shore to the country park and across the park to the cafe for another break. Out to Hound Road, Hamble Lane and Hamble station for the train home. Good sunny spells, a little chilly along the shore in a stiff breeze. 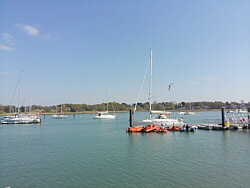 From home to Cobden Bridge, Bitterne Park, Bullar Road, Bitterne Road, Northam Bridge, Princes Street, Chapel, Itchen Bridge, Woolston, Portsmouth Road, Old Netley, Lowford, Lower Swanwick, Swanwick Shore Road, Universal Marina, the river Hamble footpath and Warsash village. Down Newtown Road and Hook Park Road, through the local nature reserve to the beach. A drinks break then up the river to Shore Road and the ferry pontoon. Caught the Hamble ferry. Up to Hamble Square and down School Lane to Hamble Point, along Hamble Shore and round the country park to the cafe for another break. Out to Hound Road, Hound Way, Station Road and Netley station for the train home. Hazy sunshine turned to cloud but pleasantly warm. 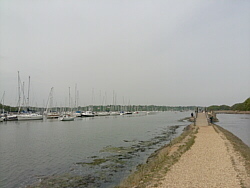 Photo: The river Hamble footpath. 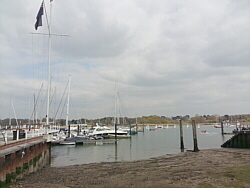 Down to Hamble Quay. Sat by the river for a while, then via Green Lane and School Lane to Hamble Point, along the shore to the country park and across the park for a break at the cafe. Out to Hound Road, The Badgers and Netley station for the train home. Sunny and warm with a strong breeze. Sunny and getting warmer. A little misty over the water. Down to Hamble Quay. 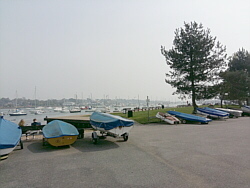 A short break for refreshments, then via Green Lane and School Lane to Hamble Point, along the shore to the country park and across the park to the cafe for another break. Sunny early but clouded over. Still a cold wind from the east. Down to Hamble Quay. Sat by the river for a while, then via Green Lane and Hamble Common to Hamble Point, along the shore to the country park and across the park to the cafe for a break. Sunny and warm with a chilly breeze in exposed places. Down Shore Road to the waterfront for a refreshment break, then along the river to the ferry pontoon. A chilly breeze, cloudy to start with but warm under clear skies later. Down to Hamble Quay then via Green Lane and Hamble Common to Hamble Point, along the shore to the country park and across the park to the cafe. After a a break at the cafe, out to Hound Road, The Badgers and Netley station for the train home. 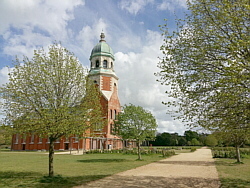 From home to Cobden Bridge, Bitterne Park, Bullar Road, Bitterne Road, Northam Bridge, Princes Street, Chapel, Itchen Bridge, Woolston, Portsmouth Road, Old Netley, Lowford, Lower Swanwick, Sarisbury Green and Warsash village. Down Newtown Road and Hook Park Road, through the local nature reserve to the beach and up the river to Shore Road. 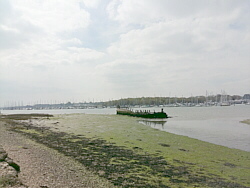 Then caught the Hamble ferry which was running from the nearby pontoon instead of its usual point up-river. Up to Hamble Square and down School Lane to Hamble Point, along Hamble Shore and round the country park to the cafe for a break. 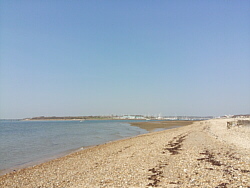 Photo: Warsash beach (Hook) looking across the Hamble to Hamble Point.